It was Charley Patton’s third record in November 1929 and the Paramount marketing department were looking for a new gimmick. Calculating it would boost their presence in the rural blues market, they released the new recording under the name the Masked Marvel, complete with a competition to guess the artist’s real name. It must have worked for them because here we are 90 years later talking about it. We figure what worked for them has to work for us so in the great tradition of music and marketing gimmicks from that era, this month, the Auckland Bluegrass Club presents the new Masked Marvel. 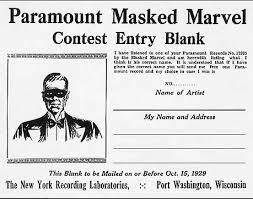 This Masked Marvel inhabits a wide variety of traditional American styles. We are going to see old timey and country, perhaps a dab of Hawaiian and gospel, and perhaps what he is best known for – a country blues or two. This Masked Marvel plucks and plays with panache the 6 string guitar, slide guitar, steel guitar, mandolin, and every now and then, like a rabbit from a hat he’ll produce an autoharp. By the time he puts it down, it is too hot to touch. This Masked Marvel sings too, and has a deep knowledge about the styles in which he performs. Honestly, you’d think he was there when they were recorded. Each song comes with it’s very own entertaining and thoroughly researched back story. If you have guessed the identity of the new Masked Marvel, be at the Auckland Bluegrass Club at the Bunker on Wednesday 14 November at 8pm precisely. You can quietly bask in your superior knowledge, and reward yourself by buying a raffle ticket. If you have no idea of the identity of the new Masked Marvel, be at the Auckland Bluegrass Club at at 8pm precisely anyway, listen to some great first half performers, before the new Masked Marvel is unmasked.